Heat oven to 375°F. Unroll dough into 1 large rectangle. Firmly press perforations to seal. Shape into 12x8-inch rectangle. Cut crosswise into 8 strips (1 1/2x8 inches each). Spread 1 1/2 teaspoons cream cheese down center of each strip. Top cream cheese with strawberry slices. (Break larger strawberry slices in half to fit on dough.) Fold dough over lengthwise to encase filling; press edge to seal in filling, forming each strip into long filled rope. Tie rope of dough into knot; place on large ungreased cookie sheet. Repeat with remaining 7 strips of dough. Brush knots with melted butter. Bake 10 to 12 minutes or until golden brown. In small bowl, mix powdered sugar and hot water until smooth. Spread over each warm knot; top immediately with sprinkles. Serve warm. Freeze-drying strawberries is another method of dehydrating. Freeze-dried strawberries will be crispier and lighter because they contain less moisture than regular dried strawberries. Color the glaze with a drop or two of food color, if desired. 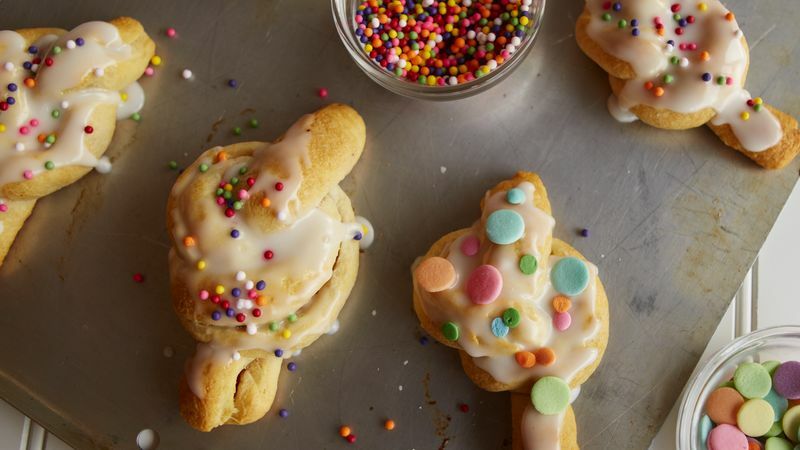 Immediately after glazing the dough knots, sprinkle them with polka-dot sprinkles or multicolored candy sprinkles.